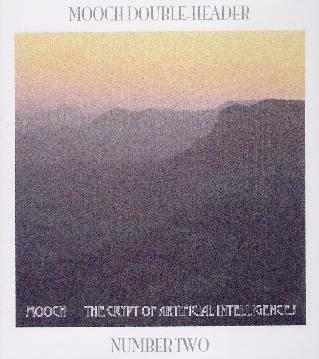 Mooch - "Postvorta" - "Starhenge" / Mooch - "The Crypt of Artificial Intelligences" - "Golden Ear Machine"
Steve Palmer has been on a roll reissuing past Mooch albums, including ones that are only being released for the first time. Ambientlive.com has so far released two double CD packages. 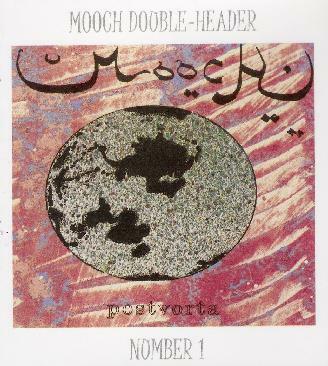 Mooch Double-Header Number 1 includes the Postvorta and Starhenge CDs, and Double-Header Number 2 includes The Crypt of Artificial Intelligences and Golden Ear Machine. Lots of looooong tracks on this album. First up is "Extended Life", a space ambient soundscape journey with plenty of percussion to give it a Rock element. You can't get anymore SPACE than this. It's a virtual parade of outer limits sounds, propelled by a continuous rhythmic pulse. It's busy… constant activity… but just enough to provide the attentive listener with lots to pick out rather than being overdone. But it's also ideal for those who just want to surrender to the chill-out grooves. Later on when Steve brings in the guitar the music has an Ash Ra Tempel feel, which I think I've mentioned in previous Mooch reviews. The title track is next and now we're really movin' and groovin'. An alien dance party peppered with the ethnic influences that inform so much of Steve's music. 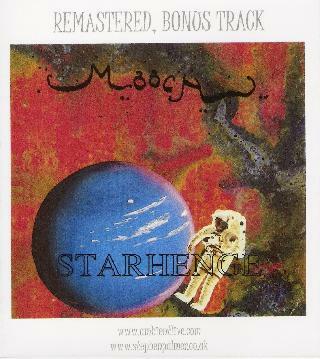 More great cosmic guitar and head bopping grooves, all in a deep space atmosphere. Imagine Manuel Göttsching sitting in with Eat Static and you might get something like this. Later in the song the alien dance band retreats to the bar and things get veeeery mellow and we're temporarily back in cosmic space. But the music soon transitions to a light percussion and chanting mantra building segment that brings the track to a close. "Winged Beings" is a heavenly meditative piece that is accompanied by a chaotic glom of electronics. It's like Vangelis is doing his thing but is being edged out by a swarm of electro invaders. "Biomass Transputer" is another cool blending of spaced out dance grooves and ethnic influences. Pounding percussion, floating flutes, chanting and assorted sounds. And at nearly 22 minutes, "Human and Euyyueh" is the longest track of the set. It begins with a couple minutes of clinging cymbals. But soon the grooves, chanting and cosmic guitar and atmospherics kick in, though it's all kind of morphed together in a swirling collaged stew. Very dreamy yet disorienting. Lots of different chanting voices are heavily efx'd and become a part of the music, much of it sounding like a remix track of all the music on the album. Very cool. Originally released in 1995, again on the Taste label, Starhenge includes Steve Palmer, along with brothers Cal & Garry Lewin, Phil Watson and Paul Coates on keyboards. The album opens with "Catal Huyuk", a brief, trippy, avant ethnic psychedelic piece. The title track starts off with light bouncy drumming, ethnic flutes, chanting and other strange voices, freaky synth patterns, and of course an overall deep space atmosphere. Other little bits crop up - like an oriental theme, a sort of slide guitar that's ethno-blues-psych sounding, and assorted other goings on. It's all very laid back so you've got to listen close to catch everything because it's so fluid and subtle. "Osiris" is a shorter track that is similar to "Starhenge", but includes acoustic guitar and calmer soaring keyboard waves. This leads into the 23+ minute "Culture". Again, the music is very peaceful, yet at the same time subtly busy. Cosmic meditative atmospheric waves are accompanied by shooting synths, jangly percussion, and a gorgeous melody created by keyboards and guitar, which fire off the melodic lines such that they flow at you like heavenly wind swells. "Jericho" is a bonus track that was unreleased prior to this reissue and is a short spacey journey that leads into the final lengthy tracks of the set. "Abu Hureya" is one of my favorites on the album, having a great combination of throbbing rhythmic pulse, Klaus Schulze styled exploration, shimmering guitar bits, and the trademark Mooch flutes, chanting, percussion and spaciness. "Dr Strangelight" felt like being in some tropical rainforest in space. The sounds of wildlife are surrounded by cosmic sounds. But it's all very sparse, being slowly and delicately constructed. An ideal choice for closing track. In summary, this album is a full 80 minutes of pure chiiiiiiil. New Age music for the Space-Prog crowd. The album opens with "Deep Space Qand-Aravanserai", a cosmic dance piece with salsa like shaker percussion, deep Dub bass, techno beats and howling space keys (analog and digital keys by Cal and Garry Lewin). I love the almost undefinable rhythmic stew on this track, which in its last couple minutes takes a turn into even deeper space and veers off into yet another percussion theme. The nearly 22 minute "India Oceania" continues down a similar path, laying down a cool cosmic groove with flutes/horns, ethnic influences and freaky alien voice samples and effects to create a cool dance party in space. Mooch have always had a real talent for throwing multiple bits and pieces of sounds, effects and music into the pot while maintaining the craftsman's control over the proceedings. The groove is continuous, and subtle transitions take the music down a variety of paths, including chanting middle eastern ragas, call-to-prayer horns, and a cool Ash Ra Tempel sounding guitar segment. "Al-Jabr" is a way too short space jazzy piece that ends just as it's taking off. I would have liked to have heard this fleshed out more. And "Brain-Map" features an interesting combination of quirky syncopated keyboard patterns and meditative ambient waves. But the last two tracks of the set, totaling about 34 minutes of music, are easily my favorites. "The Crypt (Riyadh)" is an often haunting, sometimes intense, image inducing track that is part soundtrack, part sound-art experimentation, and part space based progressive rock. It's a cinematic journey that includes some of the most challenging and adventurous music on the album. "Medina Oasis" picks up where "The Crypt" left off, using mostly guitar and effects to create a drifting and slightly jazzy ambient space excursion. The music has a spaced out avant-garde soundtrack feel, occupying a dream realm, limbo or alternate dimension of lost souls. It's space ambient, yet colorful, full of character, and even playful. Credit Steve Palmer's production work stitching everything together with the artful way in which so many elements come together and skillfully avoiding chaos. You can listen to this album over and over and find something new each time. 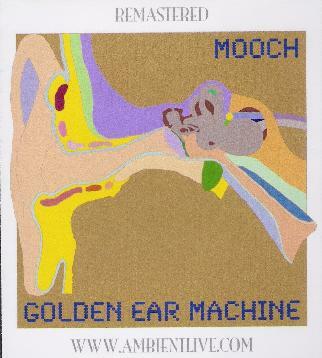 Of the four albums, Golden Ear Machine was the biggest treat for me, as it's the one that I've never heard until now. Joining Steve was Kordian Tetkov, the first live drummer on a Mooch recording, and Pete Wyer contributing acoustic guitar to the track "Spiky". I really marvel at how realistic (to my ears anyway) some of the e-drumming is on the previous albums. But right from the opening track, "Spiky", the real deal jumps at out you. The drums are really crisp and "human". Pete Wyer plays a mostly Spanish style acoustic guitar, and that and the drums are at the forefront of the music. Steve's keyboards keep things appropriately cosmic, until the end when they take over and bring the piece to an abrupt close. Very nice and a little different from most Mooch tracks I've heard. "West East West" is next and now it's really apparent what a difference Tetkov's drumming makes. He jams away in a loose jazzy style, while Steve's space guitar rips off licks. But soon the music transitions and we're off to India for some droning sitar and tabla mantras, until eventually blasting off into pure space. An excellent mixture of space rock, ethnic and jazz influences on this track, as well as lots of really tasty guitar. "From Dawn To Day To Dusk" has a nice slow buildup. Steady electro lines pulsating, soon joined by Tetkov's jamming drums. Then the keyboards take over and we're in beautifully melodic mind-bending space. Real close your eyes and be swept away stuff. "Orbital Traffic" is the perfect title for the music on this track. A busy combination of drumming, synth waves, chill-out melodies and grooves, and all manner of freaky electronics that'll get your body shakin'. And "Stellar Ritual" closes the set, being a percussion dominated piece that is alternately avant-ethnic, spaced out and childlike playful. Very interesting. For more information you can visit the Ambientlive web site at: http://www.ambientlive.com.